I love to share gardening ideas I find, or have even tried, but I know that there will always be specifics of a planting situation for which I can’t account. Soil quality, rainfall, sunlight, and pests are just a few of the elements that will play into the success of any gardening project, and they can vary widely. That means we’ve got to keep any instructions general, and hope that readers make necessary adjustments based on their circumstances. That’s great for experienced planters and gardeners… but what if you’re new to all of this? Or, what if you want to try a new kind of plant? Do you really want to take several growing seasons to get it right? I think this is a fascinating ideas; I have to wonder, though, if it will have trouble really establishing itself. OpenFarm will absolutely require a very large, and very dedicated, user base to create the kind of resource envisioned here. Can it happen? Sure – Wikipedia managed to do just that. And I think the fact that part of the funding will go to a project “champion” focused on getting the site going over the first year is very smart. 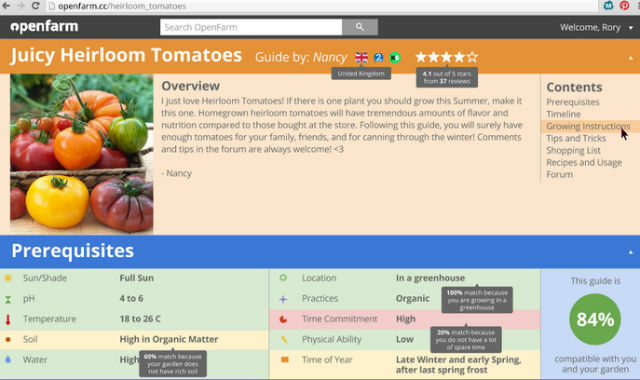 I’ll be really interested to see how – assuming it meets its funding goal – OpenFarm keeps itself in front of the right audience of gardeners and urban farmers, and motivates them to create such specific, detailed guides. I probably sound a little doubtful, and I do know that such crowdsourcing projects require a ton of nurturing to make sustainable, but I have no reason to believe that can’t happen here… and I’d love to see OpenFarm take off. Of course, first they need to raise a very modest $7,500 to get to the next step. Can you help them out? Let us know if you do, and what motivated you to contribute.